If your looking to make some extra money online and you love Indiana jones, there’s a cool website just for you. 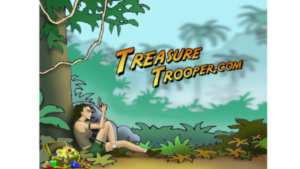 This website goes by the name of, TreasureTrooper. It’s one of those websites that use the “get paid to”, business model. The website is built with an Indiana Jones Treasure Hunt theme, that suppose to provide a wonderful user experience. Continuing on, TreasureTrooper pays for doing trivial tasks. Tasks like taking surveys, playing games, and completing offers. This site is really fun to use! But does it really pay, or is it a scam? Let’s discuss this site in further detail. Let’s also discuss users’ experiences, and the pros and cons of using this, “TreasureTrooper”. What is Treasure Trooper and how does it work? 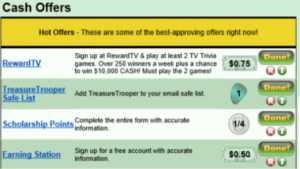 TreasureTrooper provides opportunities to make money, by offering simple tasks. You’ll earn money for taking surveys, completing offers, playing games, referring others to the website, and participating in different forum contests. The site gives a game-like feeling. It contains comic-style images of a jungle, treasures, and different animals that create an amazing vibe. It’s user interface, and game-like features, make it a lot different from its competitors. TreasureTrooper, is a U.S based company, which is located in the city of Scottsdale, Arizona. It was established in 2005, which is a long time for a website to be up, and established (I would say!). I would also say, that this would mean in my opinion, that this was a stable website. The company also owns a BBB (Better Business Bureau) profile. Something else to add: TreasureTrooper generates revenue through advertisers. The advertisers place different ads and offers on the website. When the users view their ads and offers, and participate in them, the website makes money. 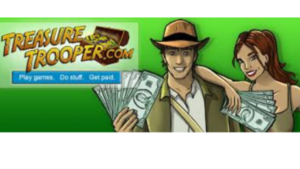 So TreasureTrooper gets paid by advertisers for promoting their products, and services. Then a fraction of that money is distributed among the members of Treasure Trooper, according to their performance. This is how “get paid to” business models normally work. There is also an affiliate side to this business, and it’s the most lucrative way to earn money on the entire website. You can earn a healthy amount of money with this side too. This could all be easily done, if you just so happened to own your own website. Especially a website that discusses online businesses, and has tons of reviews on money making programs. The affiliates get 25% of everything that their referrals spend on the website, which is a considerable amount of commission. To join this affiliate program, you would have to email the administrator of this website. If you get a positive response, you will be provided an affiliate link to refer your audience to the website. The more referrals you’ll have, the more money you’ll make. TreasureTrooper is an established company. It’s been 13 years since the company first launched, which adds a certain amount of credibility to its profile. TreasureTrooper has paid over $7.5 million to its members. This site is particularly popular in the United States, India, and the Philippines. According to Alexa.com, the global ranking of this site is 365,899 whereas in the US, it is ranked 171,728. These numbers are considered a good ranking. So, it can be said that the company has done a good job overall, and is far from failure. 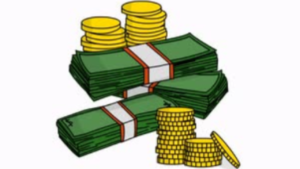 TreasureTrooper pays for completing simple tasks. The majority of the tasks are paid in cash. They pay cash via PayPal or check, when you have at least $20 in your account. The website pays on the 20th of each month. On the other hand they also have other rewards that are given out by the website, that can be used in various ways. For example, their silver coins are redeemable for gift cards that can be used on Amazon, and eBay. Similarly, there are other types of coins and gems that can be exchanged for games, gift cards, or small electronics. The rewards are a fun way to earn money, but in some cases, they can also be confusing, especially if you are new to the platform. It’s no doubt now, that TreasureTrooper’s a fun website. But let’s see in detail the pros and cons of using it. We will also discuss the things that most people like and dislike, about this website. #1) The Referral Program: This site has a referral program that provides a high commission rate. You will get 20% of the money that your referrals make, and 5% from the second level referrals. So, with only a few referrals, you could make a handsome amount of money. Get you a website to promote TreasureTrooper on for FREE! Just Click Here. A fun site: The website’s user interface creates a positive vibe. The cartoon-like images and design of the site, feels fresh. Moreover, the website has plenty of features. So there will be a lot for you to explore on this site. It will especially fascinate those who like playing games. 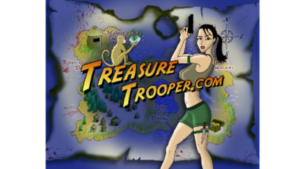 Free to join and signup bonus: TreasureTrooper is free to join, and gives a $1 bonus after signing up. Although the amount is very small, it’s still something, and could generates a positive feeling. There are other sites of the same category that give you up to $5 in bonus funds. But it’s still better to be given something than nothing. Subscription Problems: Many users have faced the problem of being charged for subscriptions they decided to try only for the trial period. The reason for being charged was that they simply forgot to cancel their subscriptions before the grace period ended. So they were charged from their credit cards, and left with a bill. Therefore if you are not careful with subscriptions, you might end up losing money, instead of making money. Qualification for taking surveys: When you attempt to take a survey, (most of the time), you’ll be given a pre-qualification survey. It not only consumes your time, but it also could make you ineligible for the survey, if you don’t meet the requirements. So in this scenario, your efforts given, may not be equivalent to the money that you’ll be possibly paid. Confusing for beginners: Some users have complained about the website being confusing to them. There was a lot going on, on the home page, and some couldn’t get the purpose of the different coins, and gems, as well as certain features presented on the website. So because of its game-like design and features, this site can be confusing to some people. Especially if you are a member. My Conclusion: Is TreasureTrooper a scam or not? After looking deep into this business, the inner workings of the website in detail, and analyzing user experiences, it can be said that this website isn’t a scam. It’s a legit business that helps people make extra cash. Should you sign up for this site or not, is totally up to you. If you like to sped your free time doing fun things, sign up for this website. Otherwise, there are other great opportunities out there for making money, if you are serious enough about making a commitment. Having said these, TreasureTrooper is a legit business that pays you for doing simple things online. It’s a fun website that contains game-like features, and designs. So if you want to earn a few extra bucks in a fun way, this is a good place for you to be. Need help finding something that could make you a reasonable amount of money? But other than that, would you happen to have something to say about TreasureTrooper being legit, or a scam? Maybe something to add to? If so, please feel free to leave a comment below. I would love to know what your point of view on all of this is! Thanks for checking out my post, and good luck with your success online! UseJewel- Earning Money Shopping For Luxury Items Online?